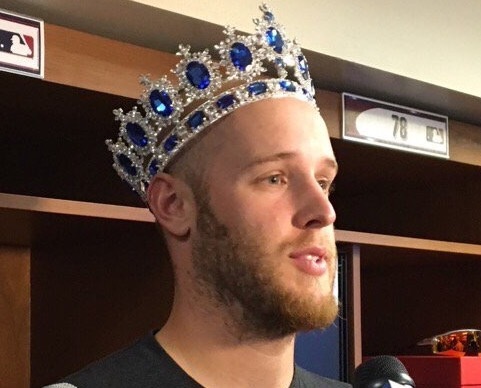 King Wheeler reigned for five prosperous innings last night before tiring and briefly ceding the throne to known pretender Hansel Robles who nearly destroyed everything Zack had accomplished during his tenure on the mound. The offense was led by new leadoff man Lord Conforto of Italy, red hot Venezuelan knight Asdrubal Cabrera, and of course the real King of Flushing, Yoenis Cespedes. Leadoff Man Conforto: Initially it seemed like Conforto made his way into the lineup because Curtis Granderson was scratched with an injury, but the team later confirmed it was simply a day off for Curtis. Michael Conforto did not disappoint in the leadoff spot. He was involved in or directly responsible for most of the early scoring. He led off the game with a single and Yoenis Cespedes drove him in with a double to left field. Then in the third inning he hit an opposite field solo homer to make it 2-0. Doing What Had To Be Done: Conforto is doing exactly what he had to do to keep his spot on the major league roster. He’s mashing in his limited number of plate appearances. Now the Mets will look terrible if they demote him. As I’ve said many times, the Mets need to continuously rotate these outfielders. Conforto leading off and playing in center/right field a few days a week makes perfect sense. Grandy is old and Conforto is the highest ceiling bat we have on the roster other than Cespedes. Cabby Is A New York Guy: In the 5th Inning the Phillies hit Travis d’Arnaud with a pitch and then walked Zack Wheeler and Michael Conforto to load the bases. Asdrubal Cabrera followed that with a 2-RBI single up the right field line to make it 4-0 Mets. Cabby is such a New York performer. Never in a million years did I think he’d show up, put on a Mets uniform, and play better than he has at any point in his career. But that’s what he’s done while he’s played in Flushing. Yoenis Cespedes also added a sac fly in the 5th inning to make it 5-0. That run turned out to be the winning run. Shattered Wrist: When Travis d’Arnaud was hit by a pitch on the wrist, Ray Ramirez came out of the dugout and Travis proceeded to sprint away from him. It was a priceless image that epitomized every fans’ opinion of Ray Ramirez. Also d’Arnaud’s wrist is certainly going to fall off in the next 72 hours. Is The Real Wheeler Standing Up? : Zack Wheeler looked great over 5 innings last night but in the 6th inning he hit a wall. It’s not surprising to see Zack tire early considering he’s missed two seasons, and he’s still working his way back from injury. At the same time, this is the kind of pitcher he’s been his entire career. These first two starts are really a microcosm of his young career. In his first start he lacked command, and that has always been one of his flaws. He had his velocity against the Marlins, but it didn’t matter. He just couldn’t execute. Last night he pitched to contact and was able to retire the Phillies lineup with ease. He was able to consistently throw his breaking ball for strikes and locate his fastball. But at the same time he fizzled out in the middle of the game. He’s always been a 5-6 inning pitcher. Before we leap to any judgments, we still need to see what he looks like once he’s fully stretched out. He still needs to show he can master the strike zone on a more consistent basis. And also he needs to show he can stay healthy. Mainly that. Robles Is The Worst: It was clear early in the sixth inning that Wheeler was tiring. But Terry let it drag out and left him in the game to load the bases. He finally pulled him with two outs and the bases juiced. Then who did Terry turn to? Hansel Robles. Robles came in and surrendered a grand slam to Maikel Franco on the first pitch. He’s really a piece of crap. Sandy’s Guys: Fernando Salas and Addison Reed slammed the door on this game. I still can’t believe Sandy targeted and brought in these two guys for basically nothing. They’ve been electric out of the pen for the Mets. I’m looking forward to the return of Jeurys Familia. The back end of the bullpen could turn out to be better than originally expected with those three arms making the bulk of the appearances. We need one more reliable guy to step up. It doesn’t look like Robles is going to be that guy. Today: The Mets swept the Phillies. Congratulations. Now Robert Gsellman takes on Wei-Yin Chen and the Marlins. It’s time for the Mets to show the rest of the NL East what we are capable of accomplishing.